I missed hearing all my favorite Truthy-types until I discovered that Unca Jim Fetzer was broadcasting on Revere Radio. But he's not the same old Fetz. In this broadcast he's scarcely to be heard as he lets the redoubtable Captain Eric May go on at length about the terror attack that was destined to take place this month in Chicago, with the Sears Tower as the Roman Candle du jour. I can only assume that Jim went out for a beer and a snack as the Captain held forth. I gotta say I've barely been paying attention to the news these days. Did the Windy City actually get whacked? With all due respect to Eric May, I hope not. It's my ambition to try a Maxwell Street Polish sausage sandwich before I step off the planet. Truly, if there's no kielbasa, the terrorists have won. 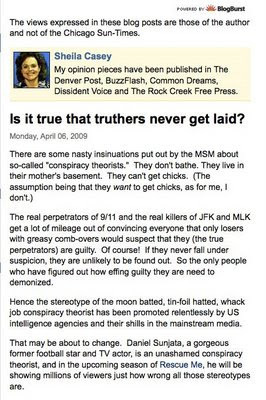 SHEILA CASEY: DO TRUTHERS GET LAID? No problems here. And you? UPDATE: This program may be downloaded HERE. BERNE, SWITZERLAND (DUI) The International Council on Numeration has voted unanimously to institute the new "Romarabic" system of numbering to be phased in over the next two years. Council Chair Claus Hess said the change in numbering was long overdue because "Roman numerals are very hard, you know, with all those letters and things--while Arabic numerals are too easy and logical. Here we seek to level the playing field so that it will again be as much of a challenge to do basic multiplication as to read the cornerstone on some old building." Math historian James Murray Staunton of NYU had mixed feelings about the change. "It's an exciting era to be living in, but the new system makes both the old Roman numerals and the standard Arabic numerals obsolete. Now everyone will have to go out and buy new clocks and watches to stay in compliance. And then there are house numbers. I just bought nice new brass house numbers, and I'm not ready to junk them. " And Dale Wayne Marks, host of Patriot Radio Network's "My Cold Dead Hand," is suspicious of the move. "This is just the NWO at work again, trying to reduce us to a mass of slobbering ignoramuses. Fine. Take away our analog TV sets and force us to buy our Bourbon in metric bottles. What did you expect? This is just another insult from the Illuminist serpents in their ploy to render us subject to their Luciferian One-World rule." Romarabic watches are now freely available on eBay and from other sources. Mr. Hess has published a guide to Romarabic numeration in Esperanto, Urdu, and Inuit. "It's a very elegant system once you get the hang of it," he said. Numeric conversion should be fully implemented by early MMX2. WITH ALL DUE RESPECT . . .
. . . I find it difficult to agree with or even get along with anyone at the moment. I think Nellie McKay says it best. UPDATE 4/6/2009: The Ministry of Truth is now officially up and running again! There's been chatter. The Ministry might be about to reconvene. Stay tuned. And why do I get the impression that Lyndon LaRouche is cribbing from him?